Last year I was asked by writer Aimee Chalmers whether I would contribute to ‘Hear The Nation’, an event organised by Women for Independence. 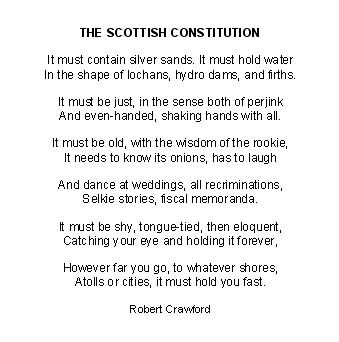 Would I alter a book in response to Robert Crawford’s poem ‘The Scottish Constitution’? I was pleased to be invited to take part and support the group’s work. I was initially attracted to their approach to the question of Scotland’s independence. They focus on the value of debate and the importance of individual choice. After living in Scotland for 25 years it feels very much like home. 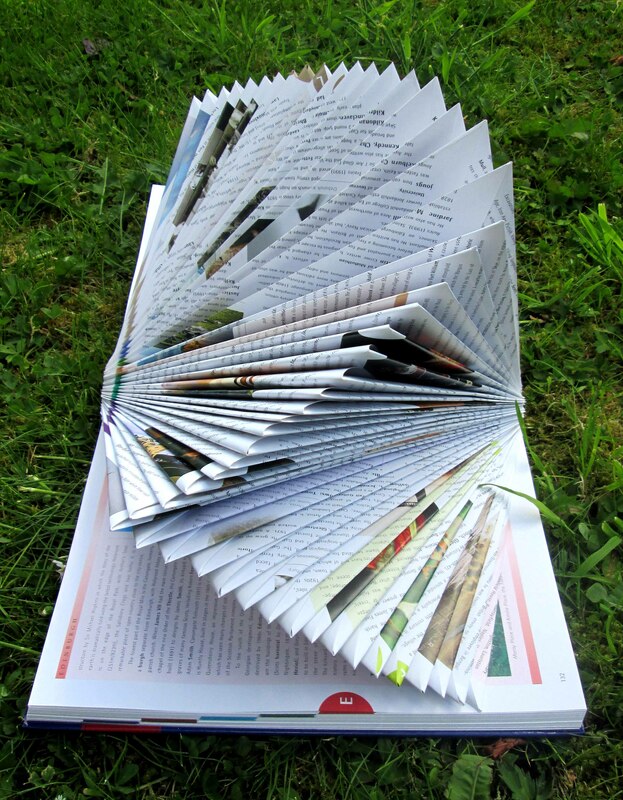 I have been altering books since 2010 now and really enjoy this art form. It is very satisfying to extend the life of a book that otherwise would end up on a landfill or sit unused in a shelf for years to come. Usually I have lots of ideas and am working away without any problems. 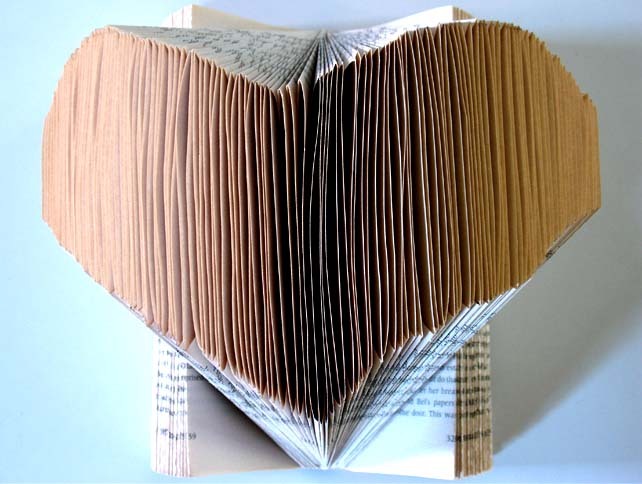 It was causing me some grief that the altered book was supposed to represent something as significant as the Scottish Constitution. 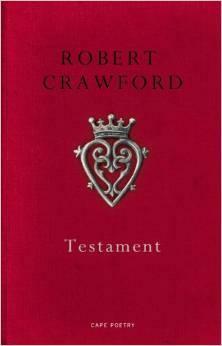 I couldn’t possibly just start and go with my gut feeling and then work with the first old book I came across. So, instead I started to dither, bought several books from charity shops and couldn’t even make up my mind which one to use! 1. I was preparing a workshop for pupils on how to be more creative. This included suggestions, such as: just start, don’t think too much about the project, pretend it is of no importance… Fortunately I realised that I really should follow my own advice! 2. Deadlines are an artist’s best friend. Once the pressure builds things usually start to happen. 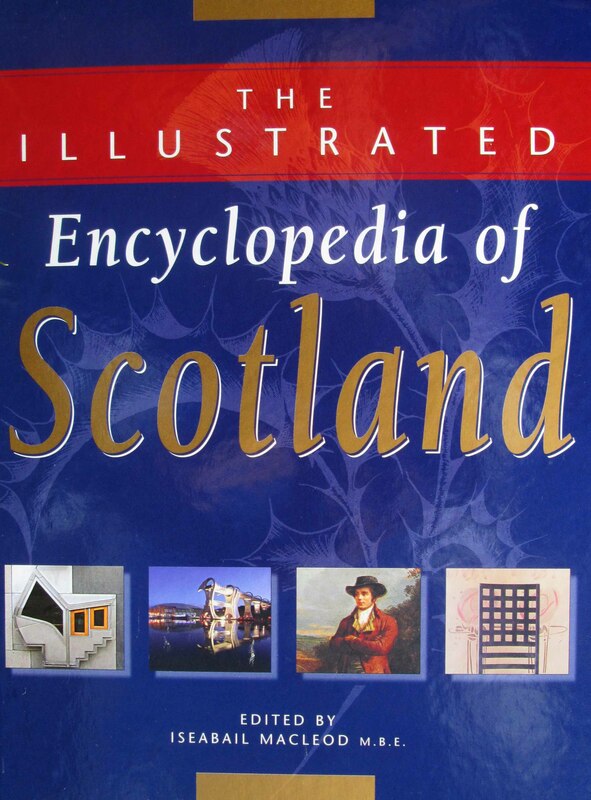 I decided to use ‘The Illustrated Encyclopedia of Scotland’ edited by Iseabail MacLeod, folding the stiff pages into peaks and creating a strong structure. For me this represented the Scottish landscape, its richness and strength. 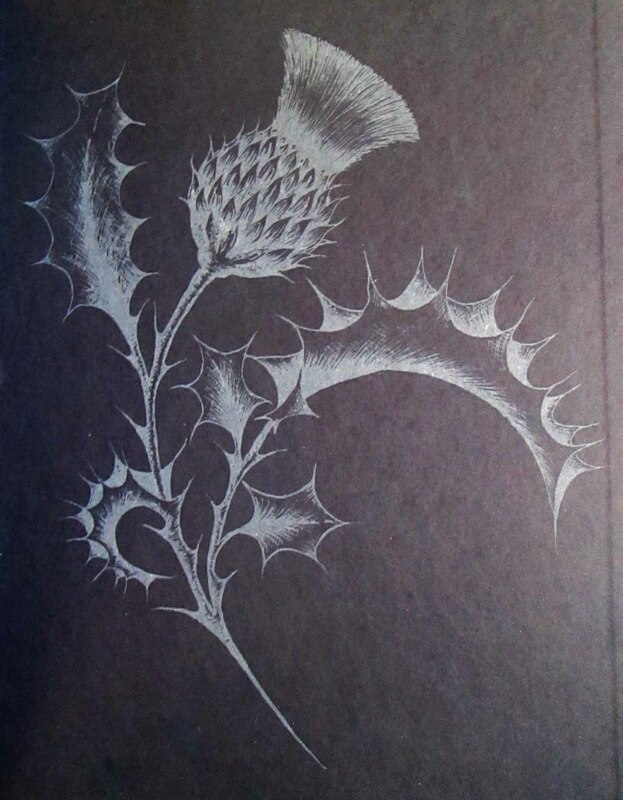 The shape and feel of the folds reminded me of the many beautiful thistles that grow in this country fitting in with the thistle motif on the endpapers of the book. 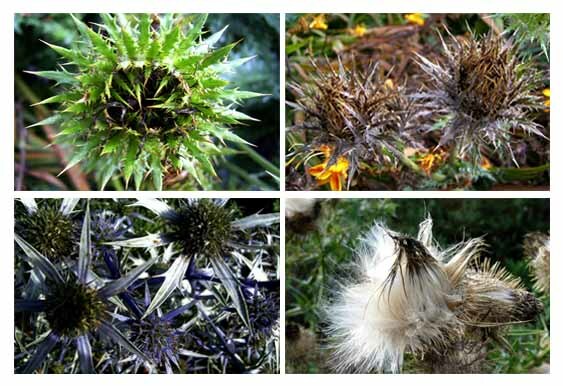 In my photograph collection I found 6 suitable close-up thistle images, all taken in Scotland. I made these into cards, each of them with one verse of Robert Crawford’s poem and stuck them at random into the folded book pages. I was hoping people would interact with the sculpture and take the cards out to read. Some of the images I selected for the cards. The book has been travelling with a hand knitted Scotland map and with Aimee Chalmer’s ‘New Chapter’, 307 altered books (mostly done by Aimee), one for each year of Scotland’s political union with England. 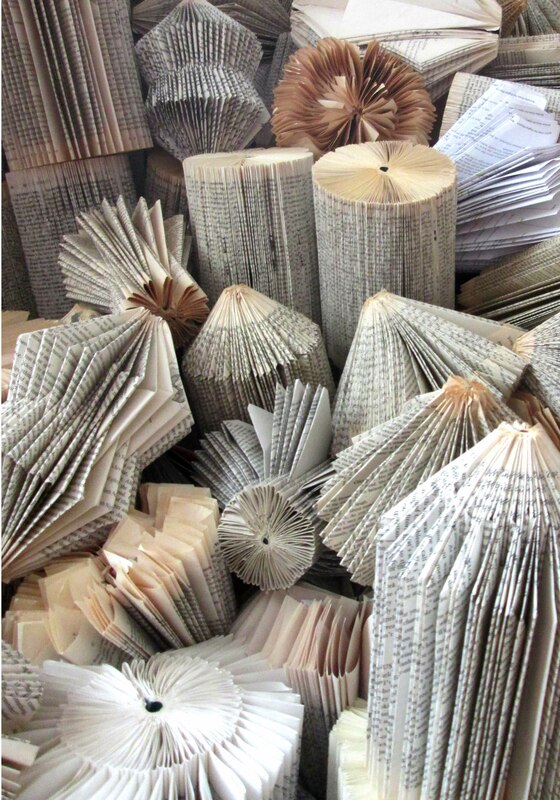 The ‘New Chapter’ is an interactive installation. 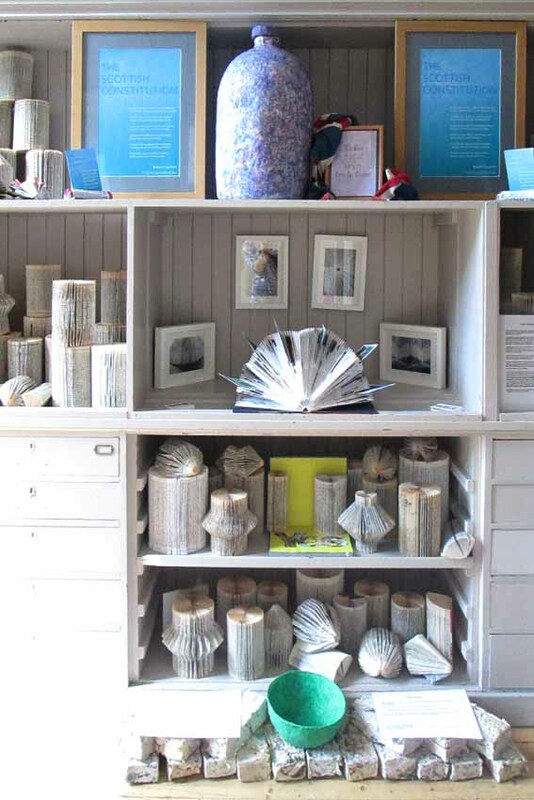 Visitors can take an altered book and – as a result – change the layout and size of the display. 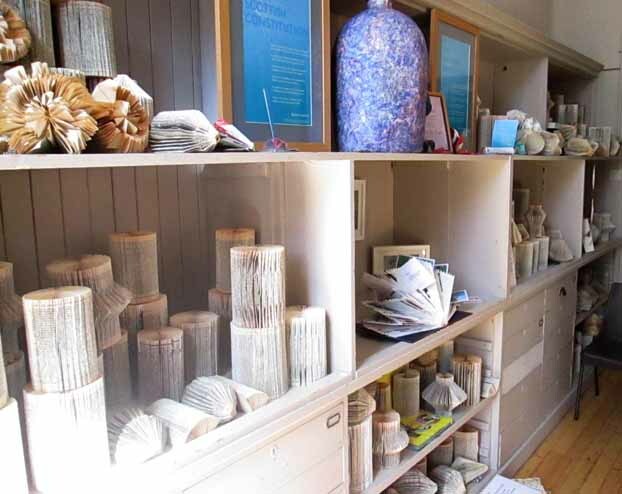 So far all of the work has been at ‘Hear The Nation’ in Cupar, at the ‘Yestival’ at Summerhall, Edinburgh, is currently at the Community shop in Markinch and will hopefully make its way to the Scottish Parliament.